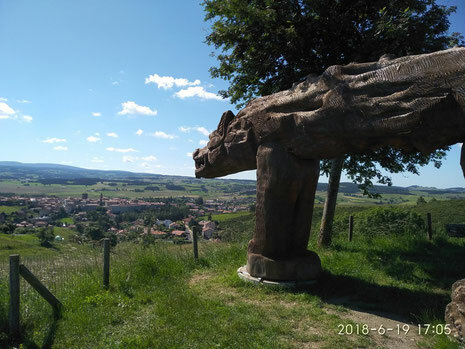 The following pages give you a summary of the main information developped in the french original version of our web site (on which you will find many pictures, diaporamas and videos of the place). Our principal aim is to offer you, at any time of the year, a warm welcome and a comfortable stay on our estate. Our estate, covering an area of 8 hectares, is located in the southern part of Les Cevennes and is dominated by the Mont Brion. In a natural and protected area, three diffferent self-catering flats are available : the largest one “Le Grand gîte”has a capacity of 12 to 16 persons, the medium one “Le Cantou” is made for 6 to 10 persons and the smaller one”La Clède” can accomodate 2 to 6 persons. In addition, you will find a 60m2 multifunction room where you can either play ping pong, dance, or organize a seminar. 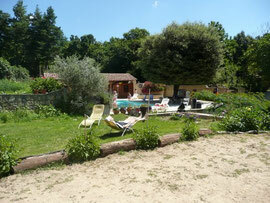 The "pétanque" area and adjoigning lawn, the swimming pool and the sauna. You will enjoy a leisurely time with several outdoors equipements such as a swimming pool (9m*5m) open from mid april until mid october and protected by a green house structure which maintains a good temperature, a sauna, a training bike, a “petanque” area, a badminton playground, a table football and the large multifunction room. 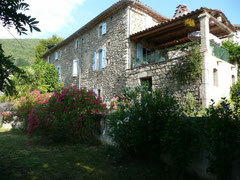 The south side of "le Grand Mas"
Our self-catering flats are available all around the year. 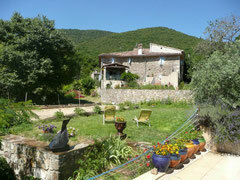 A combination of idle moments on the estate and visits of the local touristic sites. "The Grand Gîte", the entrance. Our offer : according to the size of your group, you can chose to rent one of our three flats or two of them or the whole structure (which have a total capacity of 13 bedrooms). 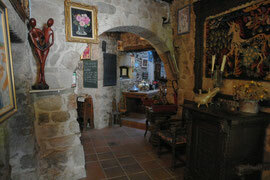 Each flat is briefly described under the title « Self-catering flats ». 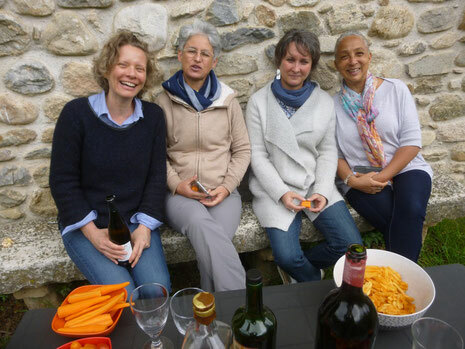 In May-June and September-Octobre only, we welcome you individually for one or several nights in « Le Grand gîte » and « Le Cantou » on the basis of a « bed and breakfast » formula. 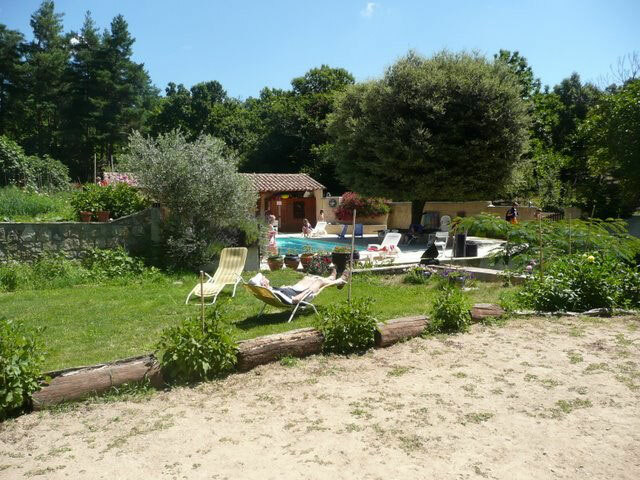 The swimming pool, the sauna, the table football, the various playgrounds and the multifunction room are shared by all our different guests unless you have rented the whole structure. For more details, see our sub-title « Shared spaces ». 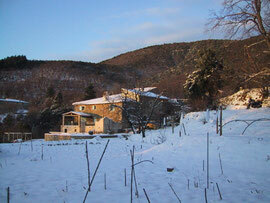 The Mas du Canton under the snow. Should you need more information on Mas le Canton, please contact us, by mail or on the telephone, we will answer you in english.